Our ‘In the Bag’ event features flavoursome Jersey Royal potatoes and fresh, peppery watercress, both in season in the UK right now, along with feta cheese. I was initially going to make a simple salad to enjoy these great ingredients more or less untouched – and of course fresh, seasonal produce is always fabulous this way – but then I got to thinking about how else I could combine them. Feta is a strong, salty cheese and I thought it could combine well with the peppery watercress to make a good sauce to smother the potatoes in; and indeed it does. Cook the potatoes in salted boiling water until tender. Crumble the feta into a saucepan and pour in the double cream. Heat gently until the cheese melts, then simmer until the sauce starts to thicken. Chop the watercress and stir it into the sauce. Cook for a few minutes more then take off the heat. You don’t need to add any seasoning; the feta is salty enough and the watercress slightly peppery. Pour the sauce over the potatoes and serve. 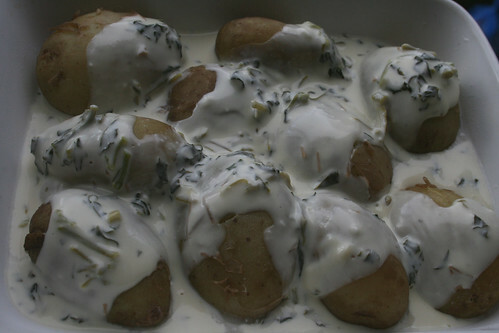 Alternatively serve the sauce on the side to dip the potatoes into. April’s ‘In the Bag’ event is running all this month, until the 30th April. Although the event features produce in season in the UK each month do feel free to substitute items with similar ones that are in season where you live. That applies to participants living in the UK too, for example if you can’t get hold of Jersey Royals feel free to use other new potatoes. All we ask is that you keep to the essence of what’s in the bag by using similar produce and trying to use at least one or two of the ingredients. Looks tasty. haven`t made potatoes with watercress before.